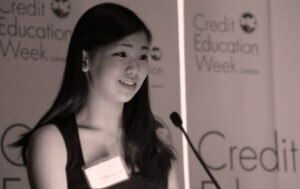 The Subprime Child takes top prize in CEWC's student essay contest. Funny. Insightful. Beautifully written. Deserving words of praise for a short essay that addresses the question: What's the dumbest thing you ever did with your money and what did you learn from the experience? The essay - titled The Subprime Child - took the grand prize of $5,000 in this year's Credit Education Week Canada (CEWC) Student Essay Writing Contest. The author, Tiffany Lu of Markham, Ontario, is among a total of 30 student winners from across Canada who addressed the same topic in their essays, and who took home prizes ranging from $500 to $5,000 as awards were presented at the CEWC Dinner Gala last week. For a full list of student award winners, please visit (http://cewc.ca/contest-winners). The words that follow do justice to CEWC. After all, it's a week devoted to financial literacy. The seduction of money is stronger than a siren’s call to a lonely sailor and the need to spend is more tempting than an unattended jewellery store to a diamond thief. And even at a mere twelve years old I understood how accurate that statement was. It was common knowledge that I was no stranger to unwise financial decisions. As the daughter of a professional shopaholic and an insomniac with a love for late night infomercials, I was born to consume. In my youth, I always believed money belonged in the safe hands of the nice salesperson’s cash register, a clear testament to my ability to manage my wealth. I religiously believed money was intended to be spent and everything I bought was a great investment. The swipe of a credit card was music to my ears and the mall was more satisfying than my favourite meal or an A on a math test. But I soon understood that as quickly as a little blue shopping bag could warm my heart, the feeling faded just as fast and left a hole of desires. In a blink of an eye, the persistent want blossomed into a bottomless, uncontrollable need and that, my dear reader, is what led to the chain of events that is now referred to as the ‘dumbest thing I have ever done with my money’. August 2009 would be an undeniably life changing month for me. The economic conditions that surrounded me were less than ideal but for this savvy business girl, it was a raging bull market. Stationary and stuffed animals were flying off my front porch, granted my grandmother bought most of it, but regardless I held the change in my hand and began to dream about all the silks and satins in the store windows. In hindsight, the twenty bucks I made should have satisfied my bubble gum and Barbie addiction but regrettably it only made it worse. As a result of my desperate desires, I did what any self-respecting business person would do; I went to my mom and begged for the money. On the condition that I would one day pay her back, she lent me thirty dollars to placate my wild shopping cravings or more likely to stop bothering her because Jeopardy was on. My ears must have deceived me; did she really just give me the money for free? Regardless, I had been approved for my very first loan. What presented itself as a harmless method of ‘getting rich quick’ spiralled into a whirlwind of borrowing from my distant cousins and spending money on baubles and trinkets to feed that bottomless pit that resided in my heart. My friends showered me with sickeningly sweet compliments and I wanted nothing more than to keep their eyes burning with envy. Needless to say, I could not exist on my flawed cloud nine forever and without a warning I was freefalling back to Earth into the deep abyss of debt. When the leaves transitioned to a beautiful array of muted autumn colours and the temperature dropped, my life would also endure a drastic change. As with all good things, my ignorant bliss came to an unnerving halt and from there my downfall began. The ground beneath me was yanked out under my feet when my parents caught wind of my guilty money scheming. Sometimes one must be cruel to be kind and nobody knew that better than my parents. In other words, my parents decided to pack up all of my toys, new clothes, and anything with a tag on it and ship it off to the rusty donation bin outside the supermarket. My cousins demanded their lunch money back and I, a perfect candidate for a subprime loan with no job, income or assets, had nothing to give. A loud revelation snuck up on me from behind. I had learned that my short term buys would always bring me short term satisfaction. Much like the seasons, the joy of cutting the tags off a new sweater was temporary. The luxurious fabric that grazed my pale skin was not enough to distract me from the bitter taste of regret in my mouth. I had spent money I did not have, on things I did not need, for reasons that did not matter. The absurdity of my logic closely resembled the most primal form of human nature. Luckily enough, this was not an institution I owed but my ever so tolerant parents. It was a shock of reality and a learning experience all in a very few ugly weeks. The silver lining of these events were the lessons that had become embedded into who I am today. The importance of managing my money and investing it on beneficial items has become increasingly clear. The money I earned from babysitting and tutoring, that did not go back towards repaying angry relatives, went directly to my University Fund and savings. My choice to invest in my education could yield infinite returns as it offers a vast network of opportunities in the future. Furthermore, even on the rainiest day my savings will shield me from the worst of the storm. Although I have out grown pink bubble gum and fancy dolls, I have a fixed amount in my budget that funds my occasional indulgences. In contrast to my 2009 shopping crusade, now I have a wise and organized plan in order to achieve my long term goals and continually avoid the enemy that is debt. Humans might be innately greedy and maybe that never-ending hole in my heart will always want something materialistic; however, today I know that I am content with my disciplined budget, accomplishments and goals for the future. I will take away two things from being a subprime borrower: one, when you owe your family money the currency of baked goods is always appreciated and two, it is possible to limit wants by choosing satisfaction over futile desires.